If you’ve been in the “game” for a while, It’s pretty obvious to most people that your Back Squat should be higher than your Front Squat and your Front Squat should be higher than your Overhead Squat. What’s less obvious is what the relationship between each should be. Lucky for you, we crunched the numbers on tens of thousands of btwb users to provide you with some data-driven insights into these relationships. Below we have some selected percentiles for the three squats so you can get a rough estimate of how you stack up on each lift. You can check your numbers out for yourself on BTWB in the Weaknesses > Squats section. If you don’t have recent numbers (or any numbers) for these lifts, this would be a good excuse to set up a testing day and see where you are. We recommend warming up and testing the Overhead Squat first, continuing from there onto the Front Squat, then finally testing the Back Squat. You could also perform the 3 tests on different days if you’re concerned about the cumulative fatigue of doing them back to back. For the men, the top 1% of lifters were Back Squatting 474lbs, Front Squatting 389lbs and Overhead Squatting 304lbs. At the 50th percentile Back Squats were 308lbs, Front Squats were 254lbs and Overhead Squats were 175lbs. For the women, the 99th percentile for Back Squat was 299lbs, Front Squat was 246lbs and Overhead Squat was 195lbs. The 50th percentile for Back Squat was 185lbs, Front Squat was 153lbs and Overhead Squats was 80lbs. The ratios between the squats are where it starts to get interesting. By looking at the ratios between your lifts, you can get some insight into relative strengths and weaknesses you might have. It’s helpful to note if your ratios are above- or below-average for the squats. For example, a below-average OHS / BS ratio might suggest a mobility issue, or even a midline stability issue. Maybe you have really tight shoulders or very limited ankle flexibility. On the other hand, an above-average OHS / BS ratio might suggest that your overall strength level is lower than it could(or possibly should) be. Between men and women, the average squat ratios were very similar. Overall, Front Squats were 83% of Back Squats on average, and Overhead Squats were 56% of Back Squats on average. A common target in the weightlifting community for the FS / BS ratio has been 85%, which is just a bit higher than the average we see among our users. In 2015 I focused a good amount of time on weightlifting training, supplemented with regular CrossFit metcons. I’ve always been a good front squatter, I’m anthropometrically well set-up for the movement, but as I weightlifted more and more, my front squat got stronger and stronger while my back squat stayed about the same. I’m naturally pretty quad dominant and have always had issues with the strength and activation of my posterior chain, and those issues got worse. A back injury was the wake-up call I needed and when I finally took a step back and checked it, my Front Squat was over 90% of by Back Squat. With that example in mind, you can use these ratios as a tool. If your percentages are wildly off (+/- 5% or greater) it might be time to assess your training and the frequency, volume, and load of each of these movements. Tweak accordingly, maybe adding some extra training on your lagging movement or doing complementary accessory work to try and get back to center. We combined both genders in this table because there was no statistically significant difference between the them. All three of the squat ratios showed decreases with age. The FS / BS ratio only decreased by 5 points total across all age groups (0.84 vs 0.79). We found a much larger statistically significant decrease in the average OHS / BS ratio. The average OHS / BS ratio for someone in their 20s was 0.59, while the same ratio for 60+ year-old athletes was 14 points lower at 0.45. That’s a pretty substantial difference. This suggests that older populations have a more difficult time keeping their Overhead Squat in proportion with their Back Squat compared with their Front Squat. This could be due to the heightened mobility and balance requirements of the Overhead Squat, and the difficulty of maintaining ankle, hip, and shoulder mobility as you age. People with above-average Back Squats tended to have somewhat higher OHS / BS ratios. People with above-average Overhead Squats tended to have somewhat higher OHS / BS ratios. People with above-average Front Squats tended to have somewhat higher OHS / BS ratios. People with above-average Back Squats tended to have somewhat lower FS / BS ratios. People with above-average Front Squats tended to have somewhat higher FS / BS ratios. People with above-average Overhead Squats tended to have somewhat higher FS / BS ratios. Stronger squats of all three types were positively correlated with higher OHS / BS ratios. Stronger Overhead and Back Squats were also positively correlated with higher FS / BS ratios. Stronger Back Squats on the other hand were negatively correlated with FS / BS ratios. So in general, stronger squats tend to be correlated with higher squat ratios. Another consideration in this discussion is how often athletes are performing each of these versions of the squat. 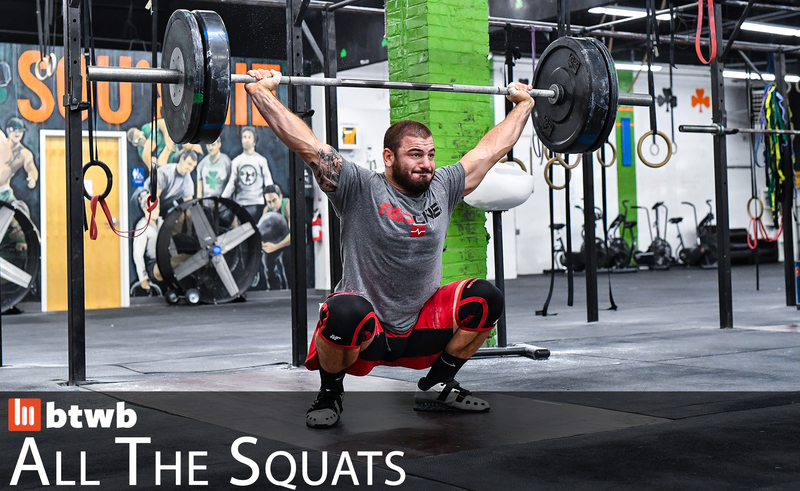 We took a look at all of each athlete’s workouts containing one of these squats. Below is the breakdown of percentage of squat workouts by squat type. We see that on average, 45.4% of an athlete’s squat workouts contain Back Squats, while 34.2% contain Front Squats and only 20.4% contain Overhead Squats. These average percentages were the same between genders. We wanted to take a look to see whether there was a difference in these percentages for top lifters. The idea being maybe the stronger athletes were training systematically differently than their weaker counterparts. So we compared the frequencies for the bottom 20% and the top 20% of lifters for each lift and charted them below. For top Back and Front Squatters, we see them biasing their squatting toward Back Squats and away from Overhead Squats. Conversely, we see top Overhead squats biasing their squatting slightly toward Overhead Squats and away from Back Squats and Front Squats. But these variations aren’t very dramatic. The top Back Squatters are only Back Squatting 2% more often than the average, and only Overhead Squatting 1.4% less than the average. It may be beneficial to run these numbers for your own training to see how close you are to the norm. If you find you are far off in one direction or the other, make sure that you have good reason for it, or think about adjusting the balance in your squat programming to bring yourself more in line with the norm. These squat ratios are just another tool in your performance analysis toolkit. If you find yourself to be far off from what these averages suggest, it makes sense to dig a little deeper into what’s going on. Maybe this information can help you identify some areas that are ripe for improvement. Maybe this will be the last little nudge you need to address your shoulder, front rack, on ankle flexibility issues. Those issues can be greatly improved with some focused mobility work to get you into more favorable positions. If you find your ratios are much higher than these averages, you might want to look into possible posterior chain weaknesses or imbalances. Keep in mind that the Back Squat is the best option for building overall squat strength, and will help to increase all your squat numbers. But increasing your Back Squat without a comparable increase in your other squats is not ideal, and it will cause these ratios to drop. In general, it’s not a good idea to try to drive your squat strength with the Overhead Squat… but if you see that your Overhead Squat ratio is lagging behind your Back Squat, some direct training will likely be helpful. I’ll leave you with this classic video of CrossFit Director of Training Nicole Carroll on her journey to 15 Bodyweight Overhead Squats.